Technivorm of Amerongen, The Netherlands added this Moccamaster Coffee Brewer Model 9587 to its growing number of first class coffee makers that guarantees perfectly brewed coffee in every cup. Customers of Technivorm Moccamaster are assured that their coffee is brewed according to the European Coffee Brewing Center (ECBC) and Specialty Coffee Association of America and Europe (SCAE and SCAA) standards. The Technivorm Moccamaster Coffee Brewer Model Model 9587 is capable of brewing your coffee at 92?C to 96?C temperature range that meet the ECBC, SCAE, and SCAA requirements. The accompanying thermo jug made of rust-resistant stainless steel maintains the coffee temperature at 80?C to 85?C. The nine-hole water spray head evenly wets the coffee grounds to avoid wastage and ensures uniform brewing. This coffee brewer features a copper boiling element fitted with a double safety guard that enables brewing time in 5-6 minutes. Additional features include visible scale indicators on the 1.25L water tank, a hand operated drip stop on the filter holder, different color choices for the aluminum heater housing, and illuminated power switch. This brewer measures 11.5 x 7 x 15.5 inches and weighs 7.8 pounds. Coffee brewed from this product comes out really hot and stays hot for up to 2 hours after brewing with the use of the accompanying stainless steel thermo carafe. Transparent water tank with visible volume markings that can accommodate up to 1.25 liters of water. Fast brewing time and uniform brewing of coffee grounds. Safety features that include dual safe guards on copper boiling element and jug sensor that stops the brewing process when the thermo jug is not in its proper place. This unit is easy to set up, operate, and clean. This product is priced higher than the average for coffee brewer. This unit, like all products with haters, uses quite a lot of electricity as it requires 1400 watts to operate. Existing owners of this Technivorm Moccamaster Coffee Brewer Model 9587 likes the fact that this product is shipped fully assembled, save for the brew head wand and filter basket. 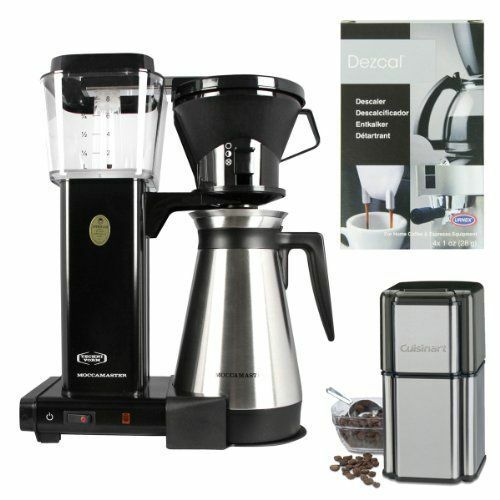 It is also easy to operate, and has fulfilled its promise of standard brewing temperature every time it is used. Some owners like the brewed coffee from this product very much, but their unit experienced some unit defects after the warranty period and they were not able to get assistance from customer service. Who Should Buy This Coffeemaker? Coffee aficionados and people who like their brewed coffee hot even after some time will surely love this brewer. This product is ideal for persons who love the taste of freshly brewed, piping hot coffee anytime of the day. You just have to operate it with a dedicated outlet and its own breaker to avoid overloading of power lines.